White's big dragon has only one eye and a possibility to get the second one on a ko. But the hot issue is the fate of the three marked white stones - and whether White can use the dead group to the left to get some advantage. 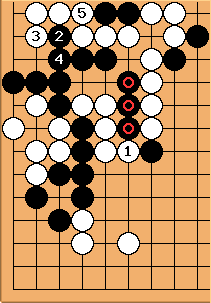 White 1 tries to pull out three stones, and Black 2 as the connection is natural. White 3 is a mistake. See discussion below. The purpose as it stands is to run away with the threatened stones. Black connects at the weak point with 4, and White plays 5, connecting the stones and threatening Black's group on the left. White remembers then that the big dragon at the top is still eyeless and jumps out with 7. 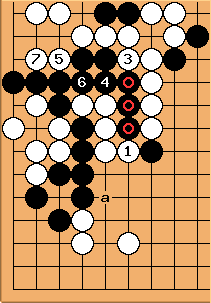 This move attacks the black groups to the left and in the center. 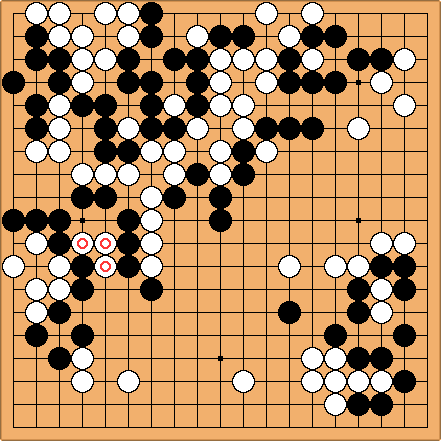 Black chooses 8 to continue chasing the white group. White starts a counter-attack on the central black stones with 9. Black 10 denies an easy life to the white dragon. If I have not read wrongly, I think White 3 in the original diagram is not good. It should be played at 1, aiming for a as well as the sequence from 3 to 7 (not to be played immediately) which captures the marked stones. HolIgor: I agree. I wanted to write about it myself. Moreover that was the initial plan. But White (that is, I) got scared at this moment. White saw at that Black has an intermediate threat. Things could become more complicated and White signed off. Now I think that was a mistake.